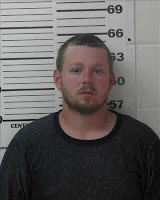 On 2/12/ 2010 Andrews Wildlife Management area reported the theft of two Chainsaws one from a locked shed and another from the bed of an employees truck. 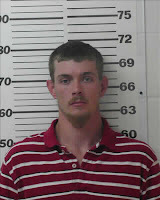 The thefts occurred on 2/10/2010 while the defendants were working in the area. The Defendants boss and other witnesses placed the two in the area of the theft and stated that they had chain saws in their possession matching the description of what was stolen. When witness’s confronted the defendants about the saws they were threatened with harm if they told of the defendant’s action. Officers investigating the case located the defendants at two different locations with each in possession of one of the stolen chainsaws. Post Miranda both defendants admitted to the thefts and were subsequently arrested and transported to the Levy County Jail. They each were booked in for Burglary of a Structure and Grand Theft. 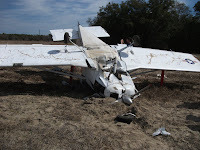 Williston, Florida-The Levy County Sheriff's Office investigated a small airplane crash in the Williston area. The Levy County Sheriff's Office, Levy County EMS and the Williston Fire Department responded to the scene. The investigation revealed that pilot, Phillip Seay Sr. 65 and his son Phillip Seay Jr. 40 were in a 1974 experimental airplane. Prior to the crash the two flew out of the Williston Airport and were enjoying a clear Sunday morning flight. While flying back to the Williston Airport the airplane experienced an unknown type of engine malfunction. The pilot, Seay Sr. realizing that his aircraft was in trouble made an emergency landing in a field near the area of 16930 NE 10th Street in Williston, Fl. It is believed that when the airplane touched down in the soft sand, the front of the plane took a nose dive and landed up side down. The two were transported to Shands Hospital and listed in stable condition. The Federal Aviation Administration investigators are responding to the scene to further investigate the crash. American Cancer Society Relay for Life . The Levy County Sheriff’s Office has some new weapons in their war on crime. The Sheriff’s Office recently traded some of their evidence guns and surplus weapons for 17 DPMS semi-automatic .223 rifles. Sheriff Smith pointed out that all 17 rifles will be made available for use by deputies in patrol. Each rifle will be tailored to an individual officer increasing their ability to defend themselves and others more diligently. Every deputy in the Sheriff’s Office will receive training on these weapons although only 17 will be issued. Currently, Smith states he will acquire additional through a government surplus program until each of his officers have the weapons they need for their safety. Training started Monday and the troops have been looking forward to this for a long time. “The only time an officer would use this rifle is if they have reason to believe there is some type of deadly-force threat out there,” Smith said.Sheriff Smith stated that his officers’ safety is his top concern and after the armed stand- off north of our jail by a homicide subject just a few months ago, and Dixie County Capt. Chad Reed’s death, he felt had to act because it was the right thing to do. On February 6, 2010, the Levy County Sheriff’s Office hosted a Basic Pistol Class as a fundraiser for the family of Dixie County Sheriffs Office Capt. Chad Reed, who was killed in the line of duty on January 14, 2010. Lt. Scott Finnen of the Levy County Sheriff’s Office started the ball rolling but was quick to mention that once the idea took off, it took on a life of its’ own. Lt. Finnen stated that people were calling him to assist and attend the class. The class had over 130 people registered at 65 dollars each. However, on the day of the event with overcast weather, 96 people attended and over 22 people assisted. “It really was a healing process for our local agencies”, said Lt. Finnen. We had instructors and volunteers from our Sheriff’s Office, Chiefland Police Department, Williston Police Department, Gainesville Veterans Affairs Police Department, Dixie County Sheriff’s Office, Williston Shooters Club, Ross Tactical Training Services, Williston High School JROTC and the Florida Army National Guard.Our local merchants and businesses also assisted. Bronson Hungry Howie’sRestaurant provided free lunch to all attendees and staff. Pickett’s Weaponry came to the event and sold firearms and supplies to the attendees with all profits over costs going to the fundraising event. Central Florida Community College Criminal Justice Academy even helped out by providing range supplies.